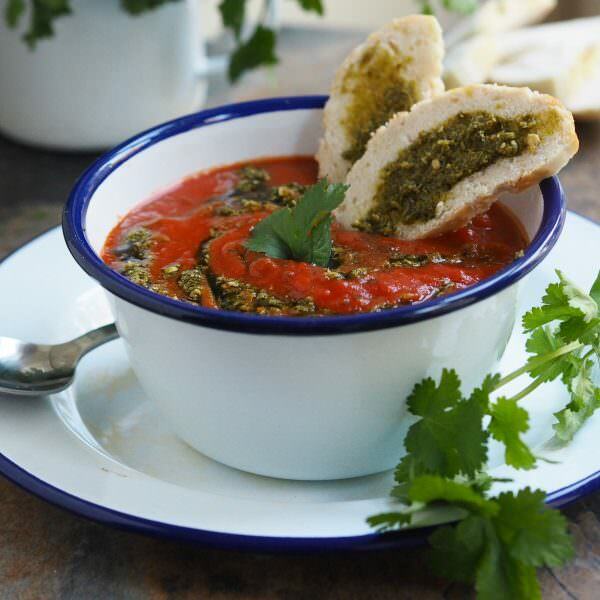 Try this fantastic winter warmer, our Tomato Soup with Pesto recipe. Heat the butter or oil in a large pan, then add the garlic and soften for a few mins over a low heat. Add the sun-dried tomatoes, canned tomatoes, stock, honey and seasoning, then bring to a simmer. Let the soup lightly bubble for 10 mins until the tomatoes have broken down a little. Whizz with a stick blender, adding half of the sour cream as you go. Taste and adjust the seasoning – add more honey (salt and or pepper) if you need to. Serve in bowls with 1 tablespoon or so of the pesto swirled on top, a little more sour cream if you wish.